MANCHESTER, NH--(Marketwired - Mar 20, 2014) - As college students across the country buckle down and prepare for their final academic push of the spring semester, Manchester, New Hampshire-based venture, Quadlyfe is busy educating college administrators and recruiters about their new mobile application (app). The cloud-based app is aimed at helping admissions professionals more easily identify, connect and communicate with potential and current students and their parents. Launched in the fourth quarter of 2013 by veterans of the interactive marketing industry, Quadlyfe is a simple, cloud-based software platform which allows colleges and universities to quickly and cost-effectively roll out a mobile/social app to improve marketing, recruiting, fundraising and the on-campus experience for existing students. "Our mission at Quadlyfe is to help schools move easily and affordably into mobile technology," said Christopher Downs, Director of Product Development. "Many schools play a seemingly endless game of technology catch-up, but we offer a mobile platform that integrates seamlessly with existing platforms and is constantly updated, without the heavy investment typically required for mobile optimization. Engaging Alumni - Connecting with the school's most passionate community to build a powerful recruiting and fundraising force. Quadlyfe integrates with existing data sources and gives schools an easy way to instantly distribute electronic information such as recruiting videos, campus news, emergency announcements, class schedules, school menus and sports scores directly to prospective and current students and parents through their iPhone and Android devices. 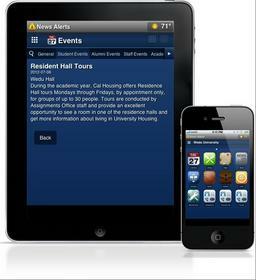 The Quadlyfe app is customized to meet each school's communication needs and brand standards. Quadlyfe is the first turnkey mobile application platform designed to help colleges and universities build stronger connections with applicants, students, parents and alumni.